Adding eggs to your daily diet can help you get ripped if you have a vigorous workout regimen. Eggs are rich in protein -- an essential nutrient to help build muscle tissue. Even though consuming an egg here and there can be beneficial for your physique, you may get bored with eating the same dish every day. Several cooking techniques allow you to enjoy your egg entrees without feeling like you're eating the same thing every day. Protein requirements vary depending on your weight. Strength-training athletes typically need anywhere from .5 to .8 grams of protein per one pound of body weight, explains Nancy Clark, a registered dietitian with SportsMD. For example, if you weigh 170 pounds, you need between 85 and 136 grams of protein each day to help you build muscle mass. Knowing your ideal protein intake helps you plan your meals so that you know how many eggs to consume. A whole egg provides about 6 grams of protein, according to the University of Michigan Health System. Enjoying a poached egg allows you to get all of the protein eggs have to offer, without using fat for cooking. Bring a pot of water to a boil. You need enough water to cover an egg, approximately 3 inches deep. Once the water is boiling, with large fast-moving bubbles, reduce the heat. Ideally, your poaching water should have small slow-moving bubbles. Gently crack whole eggs into a small bowl and pour bowl of eggs into simmering water. Allow eggs to cook for about five minutes, or until the egg whites are no longer clear. Remove the eggs from the water with a slotted spoon and allow the water to drip off. Place your poached eggs on an English muffin, slice of toast or directly on your plate. This healthy alternative to fried eggs helps set you up on a path to getting ripped. Even though whole eggs are high in protein, they also have a high fat content. In addition to the 6 grams of protein in a whole egg, you also consume nearly 5 grams of fat. Cut out most of the fat by separating the egg whites or by purchasing a carton of egg whites. Two egg whites offers more than 7 grams of protein and less than .5 grams of fat. Heat a nonstick skillet on medium heat. Instead of using oil or butter to prevent sticking, add a little calorie-free nonstick pan spray to your skillet. Pour eggs whites into the hot pan and stir with a rubber spatula. Continue stirring until egg whites are set and appear bright white. Keep your scrambled egg whites healthy by seasoning with black pepper or cayenne for added flavor. 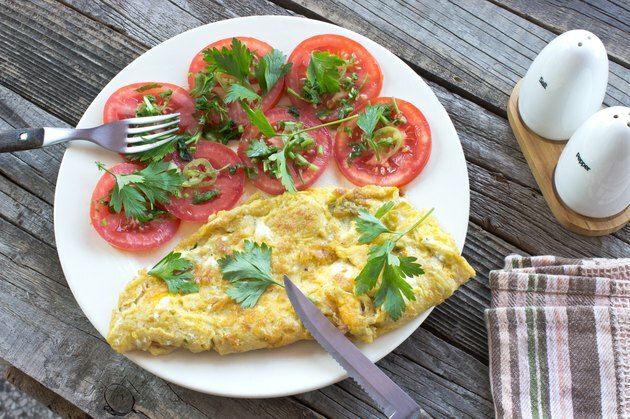 Make a healthy muscle-building omelet by separating four eggs. Mix four egg whites with one whole egg. This way, you get a lot of lean protein with only a small amount of fats from the egg yolk. Coat a nonstick omelet pan with nonstick pan spray and heat over medium-high heat. Pile in 1 to 2 tablespoons each of your favorite diced veggies, such as onions, peppers and mushrooms. Stir veggies for about a minute and add the egg mixture. Lift omelet on all sides to allow liquid to sink to the bottom. Once nearly all of the liquid is cooked, flip the omelet with the rubber spatula. Turn off the heat and sprinkle a pinch of feta or cheddar cheese onto your omelet. Fold the omelet in half and slide it onto a plate. Making omelets allows you to pack protein into your morning breakfast, as well as sneak in an extra serving of vegetables.